Indira Gandhi Open University (IGNOU) has released the Hall Ticket / Admit Card today on November 22, 2018. It has been released for December 2018 Term End Exam on the official website ie ignou.ac.in. IGNOU Hall Ticket is available online and in order to download it candidate’s nine-digit enrolment number is required. IGNOU Term End Exam December 2018 will commence from December 01, 2018, and will end on December 31, 2018. Candidates eligible to write December 2018 Term-End Exam must take the print out of IGNOU Admit Card before the commencement of the exam. The University shall not provide the Hall Ticket to the appearing candidates individually and shall not be responsible if the student fails to download the same. 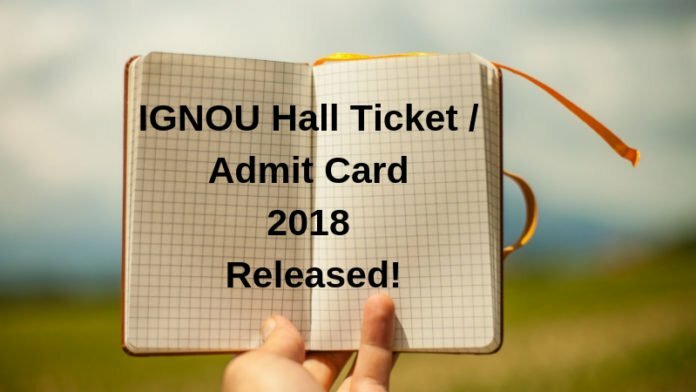 IGNOU Hall Ticket 2018 is available on the university website only and the steps to download it is very simple. Candidate can download the hall ticket by following the few steps. Access the official website of IGNOU and refer to “Student Zone” menu available on the site. To appear in the Term End Exam candidate has to carry the printout of IGNOU Hall Ticket. Candidates are also informed to carry a valid photo id proof along with the hall ticket on the day of each exam. Select the “Result” link among the links available. The results page will appear select Hall Ticket/Admit Card among the eight other links. Enter the “Enrolment Number” and select the program. IGNOU Hall Ticket will appear, check all the printed details on it and take the print out on A4 paper. The hall ticket holds information such as enrollment number, control number, candidate name, exam centre code, exam centre address, course code, exam date, and exam session. If a candidate finds any error in the information printed on the IGNOU Hall Ticket contact your regional centre. IGNOU Hall Ticket is very important for appearing in the exam. Any candidate found without the hall ticket shall not be allowed inside the exam hall. Candidate must carry his/her hall ticket on each day of the exam along and also carry the ID card provided by the university for the verification purpose. December 2018 Term-End Exam date sheet is also available on the official site. Candidates can check the exam date sheet for the exam date, course, and course code. There are their columns in IGNOU Date Sheet. The first one is the exam date and the other two columns are for exam session along with the course code. Candidates should note that he/she shall be allowed to appear in the exam only if all the necessary conditions are fulfilled. As per the university rules, the candidate who is appearing for the exam his/her registration should be valid for the course they are appearing and is not time-barred. The assignment must be submitted by them on time. And finally, the attendance for the candidate must be as per required. IGNOU is conducting the TermEnd Exam December 2018 from December 01, 2018. Candidates can check IGNOU Date Sheet to know the exam schedules. The exam will end on December 31, 2018. IGNOU TEE December will be conducted in two session Morning and Evening. The morning session will start at 10 AM and the evening session at 01 PM. For the exam centre information refer to IGNOU Hall Ticket 2018. Candidate must report to the exam centre 30 minutes earlier. The hall ticket with valid photo id proof is required to write the exam. Candidates shall be debarred from the exam if found engaged in malpractice. All The Best for December 2018 Term-End Exam!